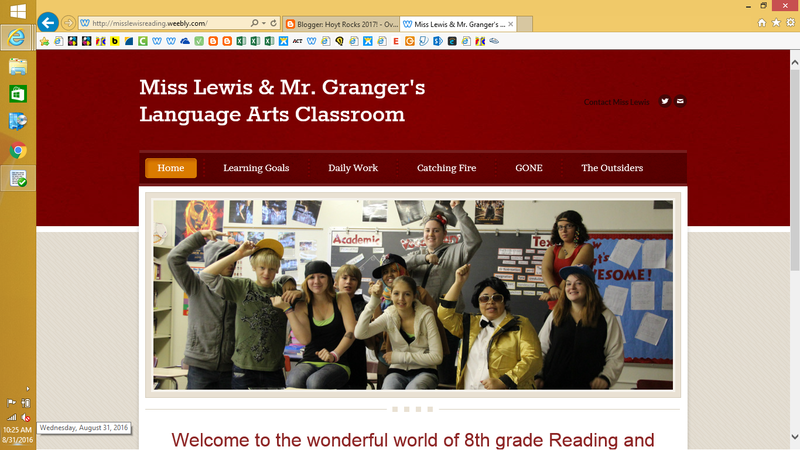 Welcome to our 8th Grade Language Arts student blog! I think Cinnas act was the most defiant because Snow only wanted Katniss to wear the wedding dress in the interview and Cinna turned it into a bird that was used to spy on the districts and the districts turned it on them. And it is a sign of rebellion. Katniss wanted to break through the smug of those who us their brains to find amusing ways to kill to make them realize that while they were vulnerable to the capitols actions they are as well. Peeta says that him and Katniss are married and have a kid on the way. This is defiant because it was in front of millions of people and the people that like the games even thought it was barbaric and the capitols people started yelling, shrieking, calling for help because they realize how bad the games are. The tributes remind the capitols citizens that they are going to be killed. This is defiant because they are turning the capitol against Snow and the games. Cinna turns the dress that Snow requested into a mocking jay, its defiant because a mocking jay is a sign of rebellion. During her private session Katniss hung a dummy and put Sennica Cranes name on it. This is defiant because she is sending a message that even the game makers are not safe from the capitol. Sennica died because she out smarted him during the games. During his interview he said that Katniss is pregnat this is defiant because he is turning the capitol citizens against the games and they are demanding change of the games. Cinna turns Katniss wedding dress snow designed into a mockingjay this is defiant because he turned her into a symbol of rebellion on national tv. What did Katniss do that was defiant? Why would these act be considered defiant or rebellious? * “She wanted to break through the smug veneer of those who to find there grains amusing ways to kill. To make realize while were vulnerable to the capitol cruelty are as well." What did Peeta defiant? Why would these acts considered defiant or rebellious? What did the tributes do that was defiant? Why would these acts be considered defiant or rebellious? * During their interviews: says snow could change the games but he doesn’t care. The capitol will miss the victors says the quell rule isn't even legal .Finnick recites a poem he wrote to his one true love in the capitol, and about a hundred people faint because they're sure he means them. What did Cinna do that was defiant? Why would these acts be considered defiant or rebellious? * Cinna turns Katniss wedding dress into a mocking jay. He turned the dress that snow designed into the symbol of the rebellion on national television. Cinna has turned me into a mocking jay. I feel President Snow would find Cinna to be most defiant because he designed a dress with symbol of the mocking jay. In the book catching fire many acts of deviance committed against the capital, but not intentionally at first. The capital has created these very gruesome games, where kids fight to the death only to become a victor, with horrible memories of the games. Katniss is basically the symbol of defiance. She wanted to "breakthrough the smug veneer of those who use there grains to find amusing ways to kill. To make them realize while were vulnerable to the capitols cruelty they are as well." Peeta was defiant as well, (Katniss's fake lover), told the whole world on live tv that they were married and that Katniss was pregnant, so now everyone is in an outrage because they think the capitol is killing a pregnant girl. After peeta announced that, the crowd had an uproar nobody could control and all the tributes joined hands. This is very defiant because the tributes should not be showing any unity before they go kill each other. Katniss's designer was also rebellious because he dressed Katniss as a mocking jay aka the symbol that the capitol failed, and have done it again. Basically I feel that Katniss had good reasons to defy the capital, and everybody following Katniss was in the right. (Paragraph 1)During Katniss's private session she hung a dummy and put the name Seneca crane on it and slowly walked away. Now I Have Plutarch Heavensbee's Attention. (Paragraph 2 ) During Peetas Private Session He Painted A Picture Of Rues Death. I'm Not Sure, I Just Wanted To Hold Them Accountable If Only For A Moment. (Paragraph 3)Cinna Made Katniss's Wedding Dress That Snow Designed Into A Mocking Jay. Don’t Worry I Always Channel My Emotions Into My Work. That Way I Don’t Hurt Anybody But Myself. In the book Catching Fire there are a few characters that do "acts of rebellion". In the following paragraphs I will be talking about of a few of them. Well first off we will start with Katniss. She shows to be rebelling against the capitol in the following form. She wanted to "break through the smug veneer of those who use their brains to find amusing ways to kill. To make them realize that while (they) were vulnerable to the Capitol's cruelties they are as well." Now an "act of rebellion" that Peeta did was that he said that Katniss was pregnant during the interview. Text evidence that supports my idea is on Pg. 256 and it says "If it weren't for the baby." For the tributes an "act of rebellion" would be that they all held hands in unity as it is stated on Pg. 258. "Then it happens up and down the row. The victors begin to join hands." Now last but not least an example of an "act or defiance" for Cinna would be that he turns the wedding dress Snow designed into a mockingjay. This is stated on Pg. 252 "Because Cinna has turned me into a mockinjay. In conclusion these are all great examples of defiance. In my opinion I would say that the one President Snow finds the most defiant would be the tributes holding hands because their point is for each district to hate each other and not be together. But their plan isn't working. During Katniss's private session she decided to hang a dummy that said "Seneca Crane" on the torso to remind the game makers that Katniss already won and that she will win once more and that no matter what she will still break the system. In the text it says " to break through the smug veneer of those who use their brains to find amusing ways to kill us." When it was peetas turn for his private session he decided to paint rues dead body to remind that the games take very young kids from peoples life. In the text it says " the people begin to sound like a herd of wounded animals , moaning, shrieking, calling for help." What Cinna did that was rebellious was turn Katniss's wedding dress into a mocking jay which President snow chose for katniss to wear during her interview so snow saw it as of cinna and katniss mocked him. In the texts it says " suddenly I am so afraid for him what has he done, something terribly dangerous, an act of rebellion itself." During the interview what the tributes did that was rebellious was hold hands which meant that they stood united and snow didn’t want that since he wants the districts hating each other. In the texts it says " we victors staged our own uprising and maybe just maybe the capitol wont be able to contain this one." The one I think was more rebellious was cinnas, since President snow chose Katniss's dress to wear during her interview but Cinna turned it into a mocking jay which is a sign of the rebellion in the districts. In chapters 16-18 of Catching Fire, we see many acts of defiance or rebellion against the Capitol. Describe how Katniss, Peeta, the Tributes and Cinna each defied the Capitol. Then use your inferencing skills to evaluate which of these acts you feel President Snow would find to be the most defiant. Your response should be a well-developed essay with text evidence to support your thinking.